Welcome TGRWT enthusiasts. We are Eran and Idit, and we love food. This is our food and cooking blog (with a twist of music). Our blog, whose name translates to "Food is Tasty", is written in Hebrew, but for the sake of TGRWT we post this also in English. But feel free to visit the rest ot the blog. There are many photos to enjoy and if you want something translated, feel free to contact us. And now – for the chocolate. 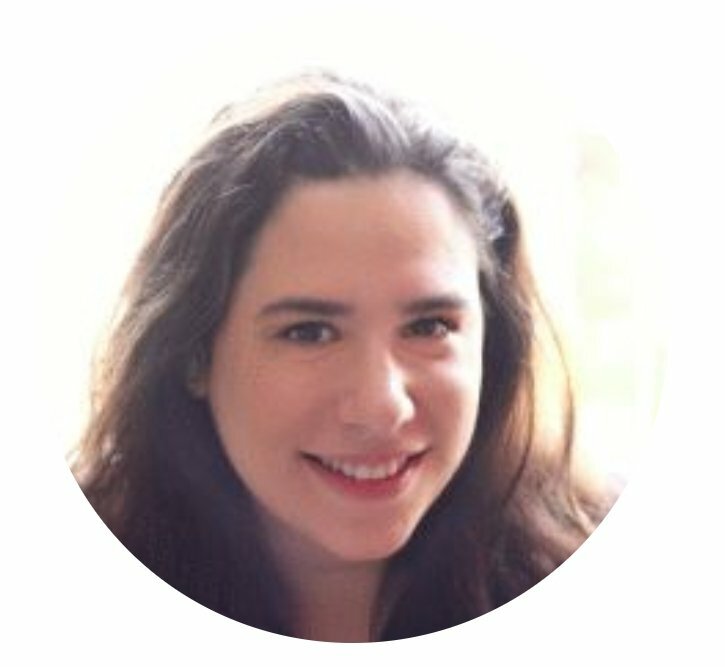 Over the last month Eran has pested other people over the next question: Should you have to give up on one of your five senses, which one would you choose? The results showed that almost 70 percent of the people chose to give up on their smell sense, and 20% on the taste sense. The rest were divided between the tactile or auditory sense. What does that have to do with a cooking blog? Well, it is a well known fact that when we talk about flavor, we are really talking about a combination of taste and smell. The taste we feel when we bite into something comes from both our taste buds and our olfactory receptors. As a matter of fact, it is estimated that our taste perception is comprised from 20% taste and 80% odor… This is quite logical, because we have so much more olfactory receptors than taste buds. Plus, our taste buds can only differentiate between five tastes: sweet, sour, salty, bitter and the elusive umami (spicy, or hot, is not actually a taste, but a pain sensation). The olfactory receptors on the other hand – well, they are capable of identifying more than ten thousand different odors… This is why when you can’t smell your food, it doesn’t taste as good. Sometimes you cannot even identify what you taste if you don’t smell it. So now think again about that question: what sense would you give up? Taste or smell? And why should we bother you with all that? Well, recently we came across a theory according to which one can create a combination of two different foods according to their smell signature, and if they have similar odor molecules, they should go well together. Heston Blumenthal uses this method quite often; see for example his combination between Caviar and White Chocolate. This method and theory is being explored in the Norwegian blog khymos.org, written by a chemist who is also a food lover. Martin Lersch, the writer of that blog, has started a project called “These Go Really Well Together”, or TGRWT. In this project, two ingredient are chosen who theoretically should go well together, according to their odor molecules. Then, food bloggers around the world come up with recipes using those ingredients. So, naturally, we decided to join the wagon and give it a try with the latest installment – using Sage and Roasted Peanuts. Start with scalding the sage leaves in the cream. How many leaves is a function of their size and your taste. The more leaves, the more sage taste. But sage can be quite dominant so you might want to be careful. We recommend starting with 5-6 medium sized leaves. Heat the cream with the sage in a small pot until it starts to boil on the sides. Don’t let it boil all over. 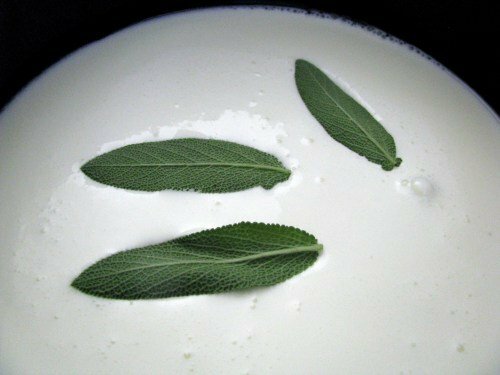 Remove the pot from the heat and let it cool down and sit for 15 minutes – this will help the cream soak the flavor from the sage. When you are ready with the cream, remove the sage leaves and re-heat the cream only a little bit, so it can melt the chocolate. Put the chocolate in a bowl and pour the cream on top of it. Now stir until you get a smooth mixture. Add the butter and stir until it is completely dissolved in the mixture. Add the corn syrup. This will give the truffles an elastic texture. If you don’t have corn syrup you can use honey, but it will slightly alter the taste. As a finishing touch, add the Whiskey or liquor and stir well. Now it is time to cool down the truffle mixture so you can shape it. There are two “schools” for this. One way is to put the bowl with the mixture in the refrigerator and let it harden. 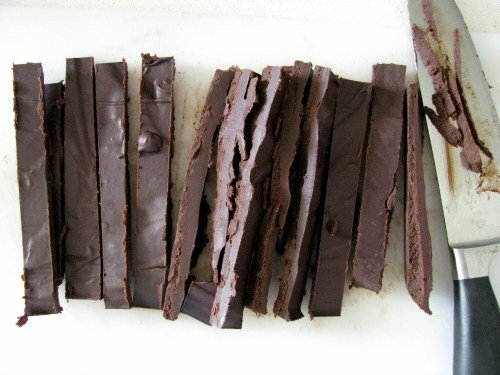 Then, using a spoon, take a little bit of chocolate mixture, roll it in your hand and put it aside. It is very messy, but fun. The other method, shown here, is to pour the mixture into a square dish and let it cool. Then, cut it stripes and cut each stripe to cube. Whatever method you choose, you will notice that the mixture is melting quickly and becomes less comfortable to work with. All you have to do is put it in the freezer for a couple of minutes and then you can continue. While the mixture is cooling, you can make the roasted peanuts coating. Just grind the peanuts to a very fine powder. 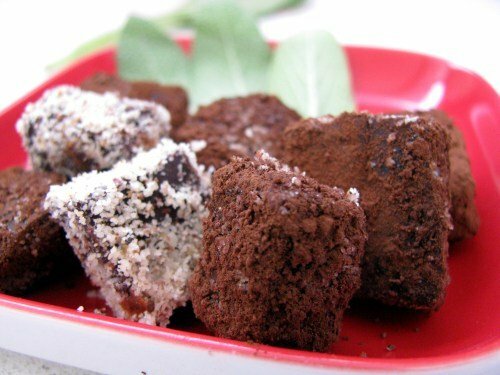 When the truffles are shaped (either in balls or cubes), roll them in the peanut powder, shake to get rid of excess powder, and roll in the cocoa powder. Now you’re sage and roasted peanuts are done. 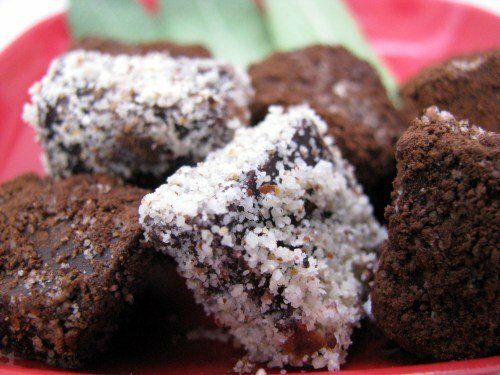 They will go lovely with a good cup of coffee after a nice meal or just like that, as a snack. Just remember to always keep them in the refrigerator. DAV Ã¨ un tale di nome Davide, italiano, che si trova da tanti anni nella “Domus Galilee”; lÃ hanno i migliori strumenti per monitorare tutto ciÃ² che si dice contro il Cammino neocatecumenale. O mi sbaglio?